I'm a bit slow this year but I finally went over to Saint Generator, offered up a prayer for a saint that Jesus would like me to get to know better and who can be my intercessor. She is new to me and I'm looking forward to getting to know her better. "Jesus Christ gave up his life that we might live," she said. "Therefore, whoever wishes to carry the cross for his sake must take up the proper weapons for the contest, especially those mentioned here. First, diligence; second, distrust of self; third, confidence in God; fourth, remembrance of the Passion; fifth, mindfulness of one’s own death; sixth, remembrance of God’s glory; seventh, the injunctions of Sacred Scripture following the example of Jesus Christ in the desert" (On the Seven Spiritual Weapons). 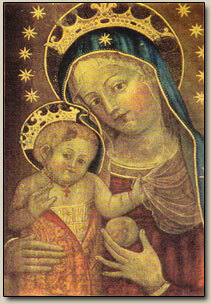 St. Catherine of Bologna, pray for me! My most recent review from Kregel is 99 Stories From The Bible by Juliet David and illustrated by Elina Ellis. The illustrations take up most of the page with a short synopsis of the bible story. It's not filtered through a Catholic lens, in fact, it's very mainstream to appeal to all Christian denominations. I wouldn't even call this a bible study for young children. It's really an introduction to the main stories of the bible which is an ideal place to start. Young children will be drawn in by the illustrations and learn the names of the the main figures as well as how they interacted with God and Jesus. The stories are important for children to learn and grow in holiness. I've seen/reviewed a few of these bible storybooks for young children and they all share many of the same stories. So what would make a buyer choose this one among the many other books out there? For me, it's the illustrations that would make the difference (besides the price). So, would I be drawn to this particular storybook over others on a bookshelf? Probably. The cover is bright and cheerful. I was given a complimentary copy of 99 Stories From The Bible for my honest review. No monetary compensation was given. 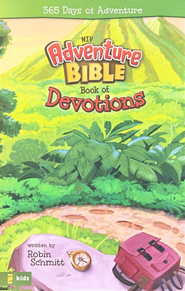 I was contacted by DJC Communications to review a Zondervan NIV Adventure Bible Book of Devotions by Robin Schmitt. This came with the Rock Solid Faith Study Bible and I did like this albeit it was not a Catholic bible. I also appreciated this book of devotions. Each day, there is scripture verse and a plausible scenario where one can choose either to listen to the Word of God, or choose to follow modern culture. At the bottom of each page, there is either a section stating "Words to Treasure" or "People in Bible Times" or "Life in Bible Times" or "Live It". Each section draws the reader into a better understanding of how to live out the scripture verse. As a typical devotional works, there is one devotion per day for the entire year. What I like about it is that it is faith in action. Teens and especially boys, as we all know, are bombarded with commercialization and the secular belief system. Which goes against the Word of God and this creates confusion for our young teens. As parents we need to help them grow in their faith and have a solid foundation so when they encounter peer pressure, God's word has been instilled in their hearts. And when they fall, they know we have a forgiving God and try not to do that again. A daily devotional geared towards this age group is ideal for preparing our young to face the world. This book is geared towards boys and I think that's important because even though they share common struggles with their counterpart, they also have unique challenges all unto their own. That does not mean that every scenario in the book involves boys, but the overall appearance will appeal to boys. This devotional book belongs to my son now and he will reap the rewards from studying scripture in this format. I received a complimentary copy of NIV Adventure Bible Book of Devotions for my honest review. No monetary compensation was given for my honest review. Recently I was asked to find a picture of the Bambinelli and I had no idea what it was. So I googled it and learned that it is a sweet tradition in Rome that occurs on the third Sunday of Advent. On this day in St. Peter's Square, one can find many children with their families waiting for a blessing from the Holy Father. What do the children have to be blessed? Their figures of the Christ Child - the Bambinelli - from their presepe at home. This day is known as "Bambinelli Sunday". 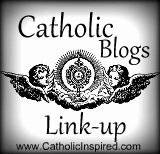 Then shortly after I saw a newly published book Bambinelli Sunday A Christmas Blessing by Amy Welborn on the product reviewer list at the Catholic Company, I took it as God's providence that I should review it. This fictional story is about one boy, Alessandro, who is temporarily living with his grandparents outside of Rome while his parents are away working in another country. While missing his parents, Alessandro learns about the Bambinelli custom and decides to make his own to be blessed by the Holy Father, however things don't go as he planned and Alessandro learns about kindness, generosity, and forgiveness. It's a very sweet story about an even sweeter tradition that happens each year on the third Sunday of Advent. The illustrations by Ann Kissane Engelhart are wonderfully imaginative. You can picture the scene in St. Peter's Square and the thousands of children who eagerly await the Holy Father's blessing on their bambino. I loved this book and I will pass it on as part of a Christmas gift to a young child whose mother chose life. We do not have Bambinelli Sunday in our church, but during our Christmas Novena, the manger scene it set up one piece a day. I will tell others of this tradition and perhaps one of them will bring their baby Jesus to church and ask their priest to bless him. Next week is the third Sunday in Advent! This reivew was written as part of the Catholic Company Reviewer Program. 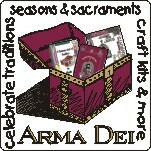 Visit The Catholic Company to find more information on Bambinelli Sunday A Christmas Blessing. The Catholic Company is the best resource of finding all of your seasonal needs such as First Communion Gifts and other items to enrich your prayer life. 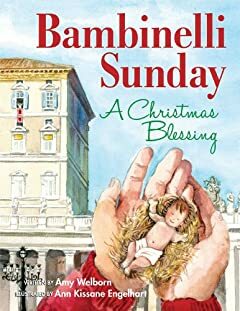 I was given a complimentary copy of Bambinelli Sunday A Christmas Blessing for my review. No monetary compensation was given. Since I am a mom of a teenager, I need to keep our activities age appropriate so he can grow in a more meaningful way with Our Lord. So, the fun crafts and activities that I enjoy, are not so fun for him any longer. So, what does a mom who has a teenager do? Include him in the adult activities of our church. We will join in the "Caminata Rosario" walking rosary for Our Lady of Guadalupe. We will participate in our Christmas Novena evening services. For nine days, we will go to evening prayer service hosted by our different ministry groups. some nights in Tagalog and others in Polish. We will go to our Penance Service. We will go to our Parish Christmas Concert. and the next evening ~ Las Posadas. We will have a busy week of faith and culture enriching activities to prepare for the birth of Jesus. as he participates and walks with the members of our parish. 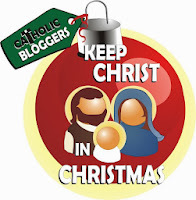 sponsored by the Catholic Bloggers Network. Be sure to visit as many links as possible, listed at the bottom of this post. I would love to hear of other ideas on how to have a meaningful Advent for teenagers. 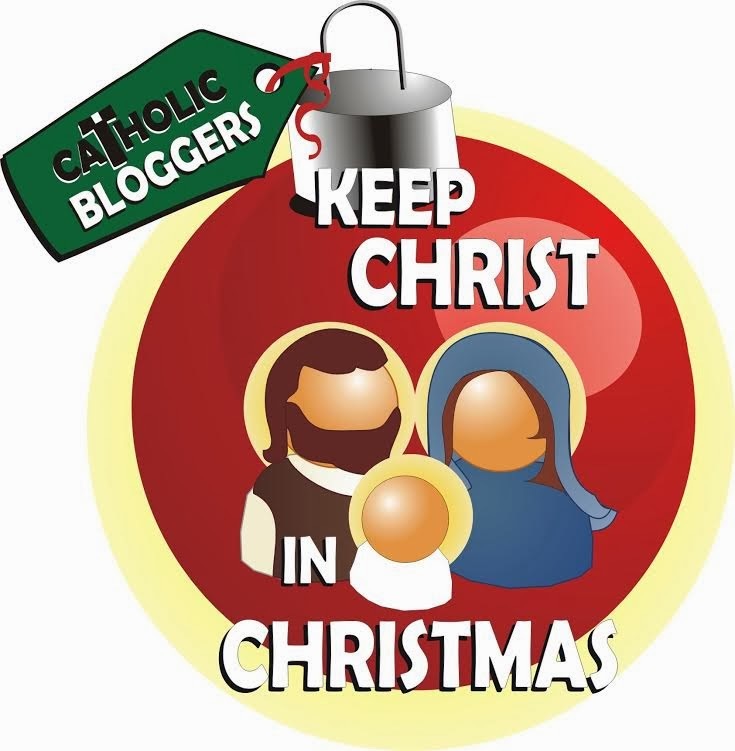 Here are the others who have joined up in the Keep Christ in Christmas Linkup. Please pop over and visit them as you can. 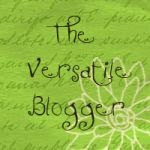 I've learned a lot of great teaching tools by visiting the bloggers below. 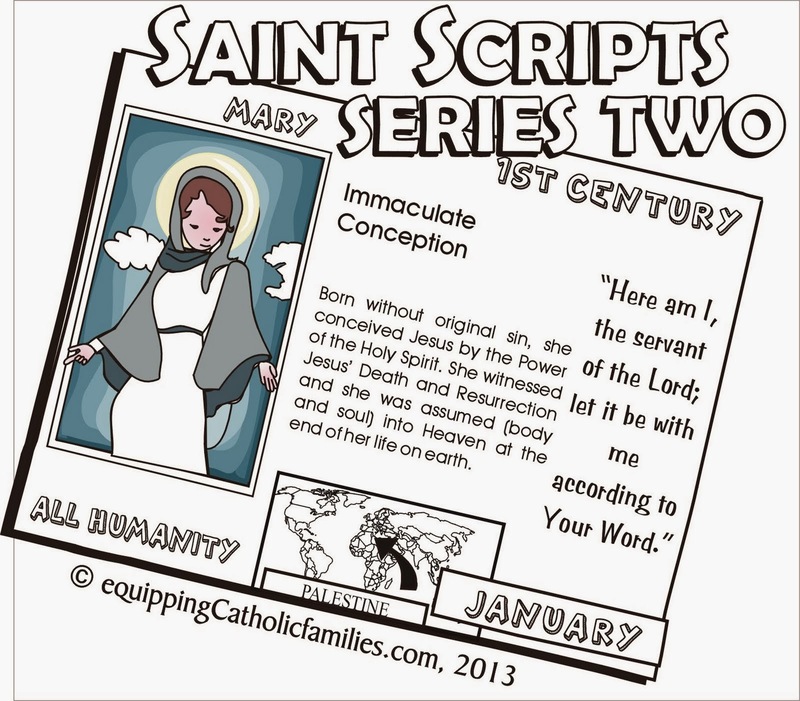 I was given the opportunity to review Saints Scripts Series Two from Equipping Catholic Families which was a collaboration of mom and daughter. Her daughter, Kelly, provided the wonderful and unique artwork and Monica did the rest! They're a great team to teach others about the Saints and Mary! 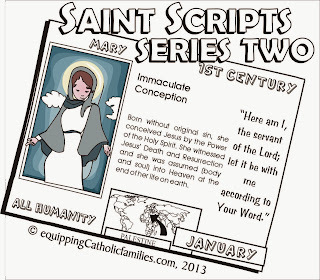 Each saint kit includes 20 full color saint cards with picture and biography. Each kit ALSO includes 20(+1) half page black and white templates with the colorable picture, plus information format for kids to research and fill in the Saint details. Monica includes instructions and suggestions for different ways of using each Saint Scripts Cathletics Craft Kit at home or in the classroom! Once you purchase a saint kit, then Monica sends you the link to download it to your computer. This weekend, I brought them to my Homeschooled Religious Education class that meets once a month. During the rest of the month, the parents are teaching their children at home. My job is to assess their progress and help fill in the gaps if needed. Our syllabus doesn't address saints until early next year, but Monica sent them to me so I could review the kit during the month of November so I brought them in. Here is what I did: I had printed out the saint cards on cardstock for durability. I placed them out on a table and my class gathered around. I have young students from 5-7 years of age so some are early readers and others are just learning. They're first reaction was to guess who the saint was and they were able to tell some of them from Kelly's artwork. Kelly's artwork is really special. It has a fun and youthful tone to it. Then the readers in the group, took initiative and read the saint names aloud. This started a discussion of what each saint was holding and why they were holding it. They especially liked the archangels and Mary. I had out the black and white templates and waited for their response. It was as I suspected, can I do this one? Can I take it home? They were eager to learn about the saints! It worked wonderfully well at exciting my class with learning about the saints. The illustrations drew their interest and the map made it real that these saints once lived and walked this earth. And that they too, can be a saint. 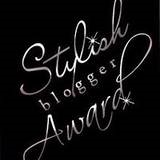 Thank you Monica and Kelly for giving me this opportunity to review one of your saint kits! I intend to print out a second copy of the colored ones to be used for a memory game and will let them pick a saint from the pack of black and white templates to learn more about with their family. 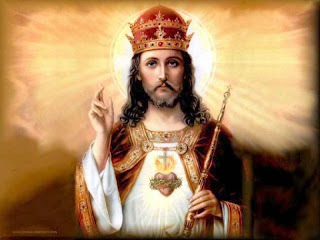 Today is the Solemnity of Jesus Christ the King who is king over all creation. In the Catholic Church, we celebrate it each year on the last Sunday before Advent to remember His authority over us all. For my class today, I spent some time teaching my class about Jesus Christ as King. We made these book marks that includes a prayer. And then followed up on an activity that they were supposed to do at home with their families. They had been instructed to write a Family Mission Statement. We talked about how Jesus is supposed to be included in their Family Mission Statements. That by obeying,being kind and loving; they honor Jesus when they treat their family in a loving and obedient manner. We then decorated our mini Christ the King cakes (banana bread with chocolate chips). The gum drops represents the jewels and the Rolos represents the gold found on royal crowns. We had a great class celebrating Jesus Christ as King!